I'm a crazy dog lady. I don't even pretend otherwise. I'm nuts about my dogs and take them everywhere that they can safely, easily, and politely go. 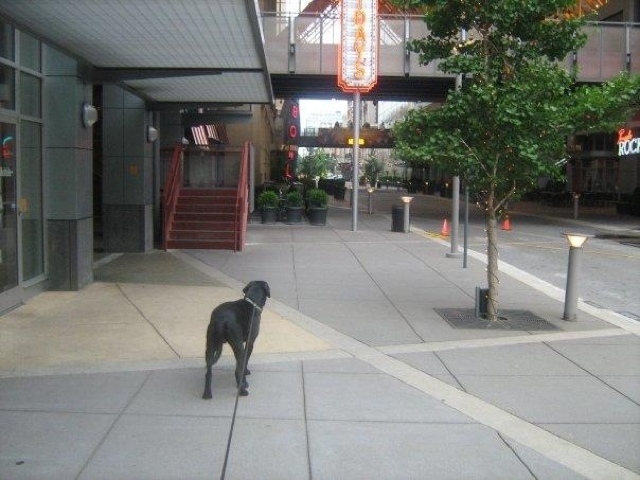 Max at Fourth Street Live! Now, my dogs are gorgeous and smart and sweet. But they aren't exactly Paris Hilton purse-dogs. My boy, Max, is an 80 pound Labrador Retriever. Sophie, my girl, is a fifty-pound Lab mix. They don't exactly sneak up on you. But they love to travel and meet new people. Here's their list of favorite pet-friendly Kentucky spots. Cherokee Park. When Max was just a puppy, we lived in Louisville's Highlands neighborhood. Louisville's amazing park system has been celebrated for so many reasons; dog-friendliness is certainly a big part of their appeal for us! My beau and I walked baby Max to Cherokee Park's "Dog Hill" several times a week. 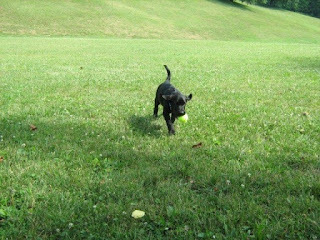 He learned to play catch and meet people and other dogs. He came home good and exhausted after several trips down the steep hill. Bluegrass Barkery. 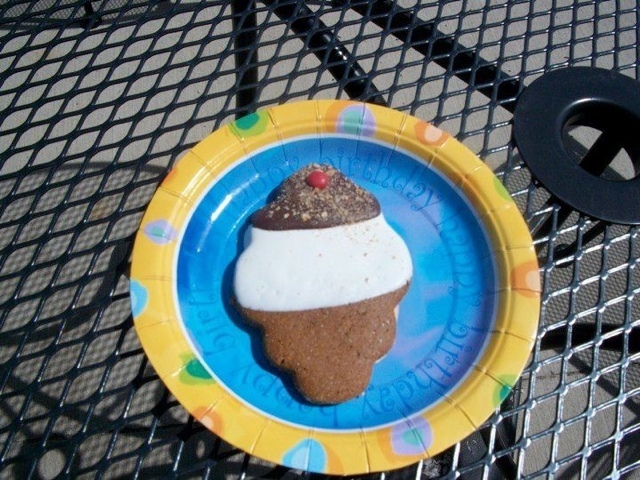 Lexington's Bluegrass Barkery specializes in safe, healthy treats for your dog. Max celebrated his third birthday there with a fun cookie, which was apparently delicious. Ashland's Central Park. When visiting family in the Eastern part of the state, Max and Sophie love to walk around the park. Soph is a particular fan of the squirrels and dogs, and just loves watching little kids play soccer in their Saturday morning league games. The Starbucks at Nicholasville and New Circle. Ok, Kentucky has caught up with the rest of the world and now has dozens of Starbucks locations. 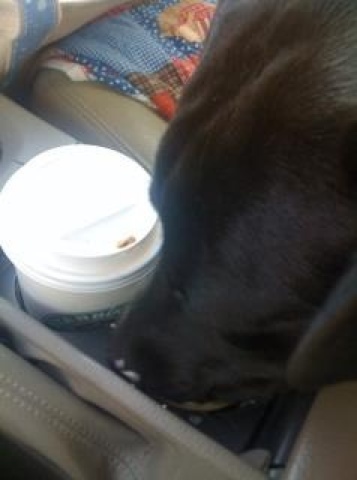 But, this store, in the middle of Lexington's shopping district, introduced Max and Sophie to "puppy lattes" -- shot cups filled with whipped cream. It was love at first lick! The Seelbach. It's no secret that, here at HerKentucky, we love the historic Seelbach Hilton. So does Max. My beau and I have stayed there with Max a few times, and he's always been treated like a little prince. As he prances through the lobby, clicking his nails on the marble floors, I'm reminded that Scott Fitzgerald was once thrown out of the very same establishment. They have their standards. The Highlands. Perhaps the most dog-friendly neighborhood I've ever seen. 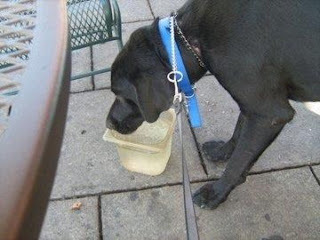 Max has been welcomed on the patios of Molly Malone's, Wick's, O'Shea's and countless other bars and restaurants around Louisville's Bardstown Road. I guess he's done his part to keep Louisville weird. 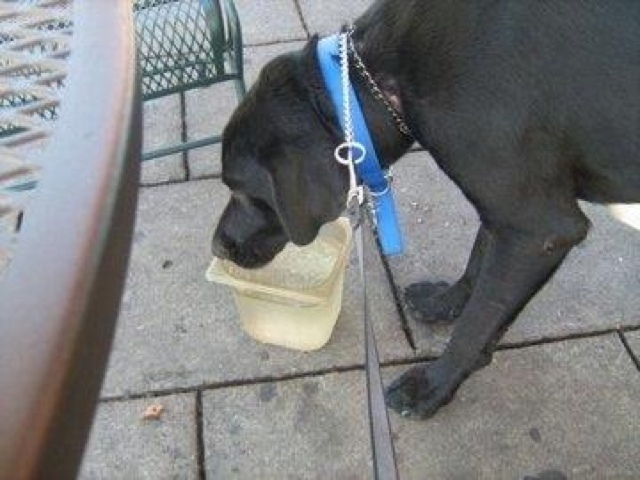 Where do your Kentucky dogs like to go? In "ashland", "bluegrass barkery", "central kentucky", "dog-friendly", "dogs", "eastern kentucky", "lexington", "seelbach", "wick's pizza"
What's the Big Deal about Derby Festival? Image via Kentucky Derby Festival. "What are you doing for Thunder?" "Have you eaten at the Chow Wagon yet?" "Have you bought your Pegasus pin?" Now, before I moved to Louisville, I thought I knew Derby. I'd been to the race itself, of course. I even knew that Louisvillians considered Oaks to be THE must-see race rather than its next day Big Brother. But the Derby Festival events left me perplexed. I knew I'd seen framed posters for Festivals past; they're inescapable in offices and family rooms in the Louisville Metro area. Still, I had no idea what the events entailed. Why would I wear a $3 lapel pin from Kroger? Is a Chow Wagon more appetizing than it sounds? And Thunder is just a bunch of fireworks, right? After living through that Derby season, I learned that Derby Festival is one of those events that separates true Louisvillians from visitors. The Pegasus pin is not only a key to admission at the Festival's events; it's symbolic of a fourteen-day celebration of the Derby City itself. Before Louisville becomes overrun with celebs and race enthusiasts, it fetes its own natives with steamboat races, parades, concerts, and fireworks. It's a two-week party that unites Louisvillians from a variety of backgrounds and interests. By the following April, I was far better-versed in Derby Festival events. When Thunder Over Louisville kicked off the season, I knew that the private parties in downtown office buildings were a more comfortable and enjoyable alternative to mingling with the massive crowds that congregate for the fireworks show. Since my beau and I aren't much for big, rowdy crowds or fireworks, we learned to time our dinner reservations to avoid the Thunder madness. We even found that we could watch a good bit of the fireworks display from our Highlands condo. As we fell into a few Derby Festival routines of our own -- Oaks brunches, the Chow Wagon, cocktails at the Seelbach -- we found that we weren't just celebrating the Greatest of all Horse Races. We were celebrating the fact that Louisville is a great place to live. Have y'all attended any Derby Festival events? In "derby festival", "derby", "downtown louisville", "horse racing", "oaks", "seelbach"
1. Kentucky basketball. Not just the storied Wildcat program-- the sheer love for the game that transcends race, gender, geography, and socioeconomic lines across every little corner of the Commonwealth. From the way everyone congregates at the Hyatt before UK games to the way every high school ball game is a sellout. 3. Dwight Yoakam. He's from Floyd County, and so am I. Even if you don't enjoy his glam-country rockabilly sound (a position I can't personally imagine, but whatevs), you have to love his brilliant acting turns as the husband attending divorce mediation in Wedding Crashers or the abusive drunk in Slingblade. 4. These two houses in Gratz Park. My favorite houses anywhere in the world. 6. The recently departed Gatewood Galbraith -- a true gentleman whose unique voice will be sorely missed in the state political arena. 8. George Clooney. He's a beautiful man. 11. The Lexington Junior League Horse Show . 12. The New Year's Day Pajama Party at Lynn's Paradise Cafe. 14. Discovering Kentucky with my dogs. From Cherokee Park to Ashland's Central Park. From snowy days in the Eastern Kentucky mountains to sunny Saturdays on Molly Malone's patio. 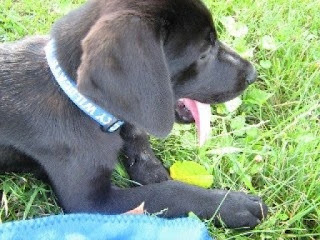 Baby Max in Cherokee Park, 2007. 16. The Kentucky Governor's Scholars Program. Where I met my future husband, though it would take me more than a decade to figure it out. Where so many friendships, partnerships, and relationships were sealed. Where at least one friend's husband learned to crochet. 17. The University of Kentucky's campus. 18. Kentucky politics. Hilarious. Fascinating. Infuriating. In "bourbon", "dwight yoakam", "eastern kentucky", "favorite things", "gatewood galbraith", "george clooney", "governor's scholars", "gratz park", "highlands", "lexington", "restaurants", "seelbach"
This weekend, a Nashville-based friend Facebooked me for recommendations for a summer trip to Louisville. I guess it's where I've lived in (and loved) three amazing Southern cities, but I get variants of that email all the time. "Where should I stay in Louisville?" "Where are the best places to shop in Nashville?" "Where should I eat after a day at Keeneland?" -- I actually keep my responses on file in my email account and then re-work the answers to compliment individual friends' personalities, tastes, traveling preferences and companions. I've never really been to the Yum! Center, but it's supposed to be an incredible venue. It's right in the middle of Downtown Louisville, and you could have a fantastic trip without ever leaving the Downtown area. The guys on the trip will probably want to see the Louisville Slugger Museum. If baseball's your thing, the RiverBats - the Minor League team - play downtown. The Frazier Museum has a lot of historical war/arms stuff. The Muhammad Ali Center is also quite neat -- it's kind of a walking tour of The Champ's life, as well as a cultural center that supports a lot of education and charity events. There are also some very cute galleries/museums up and down Main Street, near Slugger, Frazier and the Ali. As for hotels, I would strongly suggest either 21C or the Seelbach. 21C is a very hip and boutique-y museum hotel. The restaurant inside -- Proof on Main -- is extremely cool. Excellent locally sourced food, insanely good cocktails, and a very artsy decor -- all without being too pretentious. Proof also has a fantastic gelato cart on the street during the summer -- I can't recommend it highly enough. The Seelbach is way more traditional with four-poster cherry beds, marble lobbies, etc. I feel like a princess every time I stay there. It has some really cool little bars, the best Starbucks in town, and an amazing day spa. It also boasts the only five-diamond restaurant in the state. They're even dog-friendly, and treated Max like a visiting dignitary. Fitzgerald actually got thrown out of the Seelbach for public drunkenness and then set Daisy's wedding there when he wrote The Great Gatsby. The Galt House is kind of a non-descript conventioners' hotel, but it does have an amazing view of the river. There is also a really good high-end steakhouse, Jeff Ruby's, at the Galt House that's like a regional Ruth's Chris. Good, big steaks and a fantastic wine list. 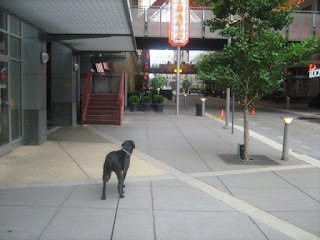 Max visits Fourth Street Live. My very favorite breakfast in the world is at Toast on Market. The Blueberry-Lemon Pancakes are insane, as are the pancakes that are dressed out like a pot roast sandwich. Their hash brown casserole is incredible as well. Also on Market is Garage Bar, which is a high-end wood-fired pizza place that also includes a great oyster bar. Downtown, just by the Seelbach, is a kind of touristy entertainment district called Fourth Street Live. There's a Hard Rock, a MakersMark-themed restaurant/bar, and a lot of little restaurants and bars. It's a fun place to people-watch and go out for drinks. I think they even have Yum! Center adjacent parking, and there is often live music and other event-y kind of stuff going on. Oh, and if the weather permits, you can go out on a steamboat. The Belle of Louisville and the Spirit of Jefferson do lunch and dinner cruises and little sightseeing excursions. It's a very neat way to see downtown from the river. If you want to venture just out of Downtown, the Highlands is a fun, eclectic neighborhood just minutes away. Very cute and cool (we lived there for years) shops and some of the best food anywhere. Lynn's Paradise Cafe is a cute, funky diner with fantastic food. Lunch and dinner are really good, and the breakfast/brunch is legendary. Wick's Pizza is kind of a neighborhood favorite -- huge pizzas with tons of quality toppings. There are some really great nicer restaurants up and down Bardstown Road (the main street going through the neighborhood); if you're up for Latin Fusion, Seviche is our favorite restaurant anywhere -- fantastic seafood and mojitos, and my beau loves their skirt steak, too. I absolutely love the Louisville Stoneware factory--they do tours, paint-your-own, etc., and their big summer sale should be going on. There are also several really cute Irish Pub kind of places in the Highlands -- Molly Malones and O'Shea's are the kind of places where everyone from college kids to Congressmen go -- very laid-back and fun. The one thing that would be worth driving out of downtown would be Churchill Downs. The summer meet will be in full-force by early June. For just a regular weekend race, you should be able to get tix -- you'd be fine to just dress like you would for an afternoon wedding or a "coat and tie rather than suit" church. If you're in town on the right weekend, I'd hit up Downs After Dark, which is a fun night-racing event. Louisville is a really fun city. It can be a little more Midwestern than the rest of Kentucky -- people talk and walk a little faster and sure do drink in public more than they do anywhere else in the state. I think y'all will really like it, though. It's beautiful in the spring and summer! Also, it has really easy roads to navigate for a city its size; you really can get from one part of town to another pretty rapidly. The biggest drawback to Louisville in the late spring/early summer is the weather. It's located right along the Ohio river and gets a lot of the river basin storms/tornado watches. What about y'all, dear readers? What's on your "Must-See Louisville" list?? In "21c", "churchill downs", "downtown louisville", "highlands", "kentucky places", "louisville stoneware", "restaurants", "seelbach"
Louisville's Seelbach Hotel is a throwback to more elegant days. With a storied past that includes bourbon with Scott Fitzgerald and poker with Al Capone, the Seelbach is a flashy time capsule amidst downtown Louisville's office buildings and tourist sites. Built in the early 1900s by Bavarian brothers Otto and Louis Seelbach, the hotel became synonymous with luxury. The early guest list included gangsters like Al Capone and Lucky Luciano, as well as Presidents Taft and Harding. 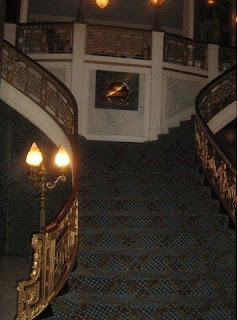 F. Scott Fitzgerald is said to have been ejected from the Seelbach after a night of debauchery, and later included the hotel as the backdrop for Daisy and Tom Buchanan's wedding in The Great Gatsby. The Seelbach has been renovated, rebranded, and reinvented many times since its 1905 opening, but retains the elegance and charm of its early years. Most every Kentucky girl has a Seelbach story; we've attended frat formals and weddings in the Rathskeller, met colleagues for drinks in the lobby bar, and dined in the five-diamond Oak Room. It's as much a Louisville tradition as baseball bats or horse racing.